Today I thought I’d share one of my own Mouthwatering Moments with you! This scene is from THE JANUARY WISH, and unfortunately it is not published, but I hope it will be one day. ‘Especially at your age,’ Mark said, spicing his words with sarcasm. ‘She sure is,’ Sylvia replied, accepting Mark’s offer of his outstretched hand. ‘I’ll have a hot chocolate,’ Sylvia replied. Mark smiled and rushed inside. A staff member was wiping down tables and the last of the customers were filtering out. He paid for his order and then got back in the car, placing the cardboard tray containing the hot drinks on Sylvia’s lap, and the paper bag containing her ‘surprise’ between the two front seats. ‘Let me guess…a dandelion chai for you?’ Sylvia asked. My favourite meal: It’s hard to choose one favourite meal, but a meal I cook often that I love is lamb cutlets with sauteed bok choy and mushrooms, drizzled with toasted pine nuts and mustard dressing. The combination of flavours is beautiful. Posted on May 4, 2012, in Excerpts, Mouthwatering May and tagged books, Mouthwatering May, Mouthwatering Moment, the january wish, women's fiction, writing. Bookmark the permalink. 4 Comments. Love the walking stick line. And the rest. AND your favourite chocolates! Speaking of chocolates…. now I’m tempted! 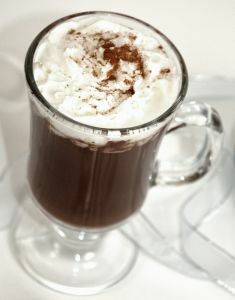 I love hot chocolate milk especially at cold night with a book in front of a fire place.